Case A: You want to have a back up copy of your vital Android contacts on your PC in case the disaster strikes and you lose them. Case B: You just got a new smartphone and want to import Android backup contacts from your old Android phone to it. This guide introduces two easy ways to backup contacts on Android, one from your Google Gmail account and one from your Android phone directly, depending on where your contacts are saved to. What if all or most of your contacts are saved on your Android phone? Don't panic, you don't need to save them to Gmail account manually. MobileGo is a great handy Android contact backup tool for exporting contacts to your PC with one single click. If you're using a Mac, please turn to MobileGo for Android Pro Mac. Note: The following guide uses Windows version screenshots of Wondershare MobileGo for Android . The way to accomplish your task on your Mac book is almost the same. Be sure you've downloaded the right version according to your situation. To get started, download and install this backup contacts Android manager on your PC. After finishing the installation, you ought to run it. Connect your Android phone to your PC via a USB cable or via Wi-Fi. This program will automatically detect your device and shows it in the primary window. Then click "Contacts" tab on the left pane to enter the contact management window. Note: Wondershare MobileGo for Android is fully compatible with all Android phones and tablets, like HTC/Motorola/Sony Ericsson/Samsung. Here is the full list of supported Android devices. 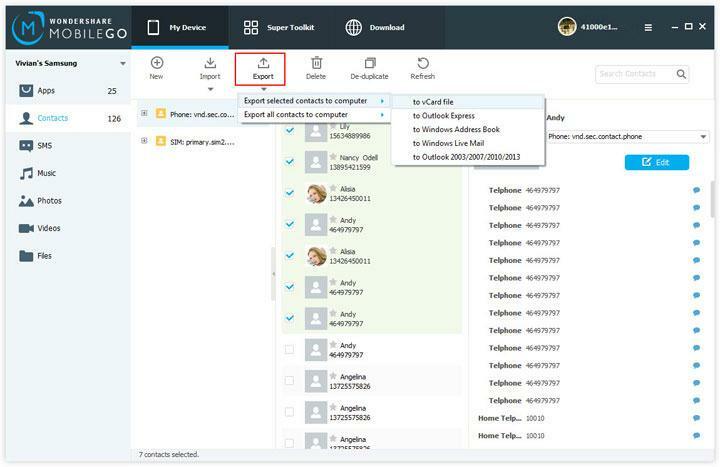 The contact management window is as below. Select your wanted contacts and then click "Import/Export" button. This will bring up a drop-down list. choose "Export selected contacts to computer" or "Export all contacts to computer". Then, a pull-down list appears on the right, you can backup contacts to Outlook Express, Outlook 2003/2007/2010, vCard file, Windows Address Book, and Windows Live Mail. If you save all your contacts to Gmail account, you can just log in to your Gmail account you used to save Android contacts. Choose contacts you want to backup and click "Export". Select vCard format and save contacts to your PC. You can open and view them with Address book. Both ways are easy to comprehend, but I highly recommend Wondershare MobileGo for Android. 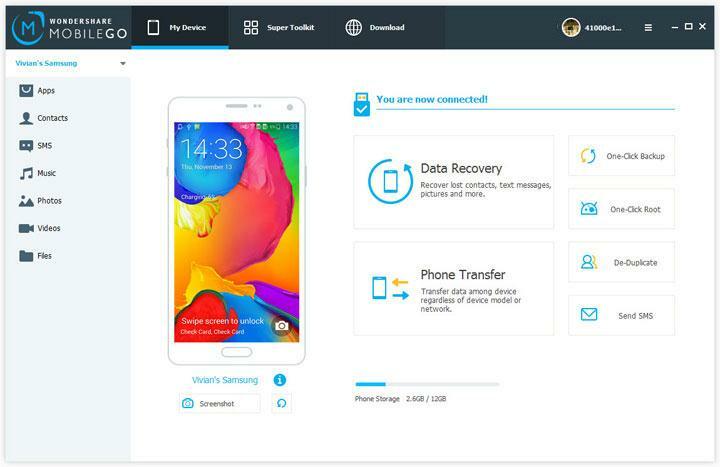 Alongside Android contacts backup, this program empowers you to transfer music, movies, photos between Android phone and your PC, send SMS from your computer, and install or uninstall APK files on your Android devices, providing one-shop management for your Android phone.